Light a spark in your spirit at Bear Bottoms Chalet. Take in the View at 2,800 ft. Enjoy the full kitchen upstairs or the great outdoor kitchen. Tensions fall away in the soothing hot tub. Roast marshmallows under the starry sky at the fire pit. At Bear Bottoms Chalet enjoy sunrise to beautiful sunset views. With an all log wood interior, this mountainside chalet features a flat screen TV, gas fireplace in the bedroom, cathedral ceiling and sky lights, queen sleeper sofa, and a fully equipped kitchen, and full bath. ~Walk-in shower on lower level. The en suite bedroom has a queen log bed, TV, ceiling fan, and full bath. 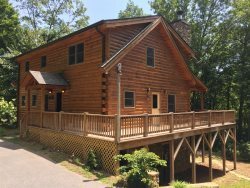 Outside: 1200 square feet of deck, covered patio with hot tub, an outdoor kitchen, gas grill, fire pit, charcoal grill, outdoor shower, and sun deck with loungers. The outdoor kitchen features a bar and table outdoor entertaining. Very Clean, Relaxing, Private, Romantic. Some have described it as therapeutic. Everything you need to get you started. Just bring food and drink. You're within 20 to 30 minutes from hiking, fishing, boating, and Harrah's Casino with gourmet restaurants. Easiest check in experience ever! Beautiful property! Would recommend!! We loved the hot tub and the gorgeous view! The property was very exclusive and absolutely beautiful. We had everything we needed to cook and eat in the kitchen. The hot tub view was also amazing. We enjoyed sunrises off the kitchen patio in the mornings as well. We thoroughly enjoyed it and would do it again! We thoroughly enjoyed our weekend getaway at this cabin, it is cute and secluded. It was easy to find and well equipped. The view from the hot tub was incredible! We walked thru Deep Creek and loved the waterfalls, the trail is easy and beautiful Thank you! We had a great time! The view was amazing and we enjoyed the stars from the Hot Tub! Everything inside the cabin was very clean and comfortable. Thank you. Would love to return here one day! This is a great lodge with wonderful views. It is clean and very cozy, also very well equipped. We loved our stay over Thanksgiving. The area and the Smoky Mountains are very beautiful. Thank you for a wonderful stay. We celebrated a fantastic Thanksgiving in this well appointed cabin. We enjoyed seeing all the wildlife and experiencing the fall weather. The cabin is very cozy and we had a lot of fun. We will certainly recommend it further. What an unbelievable weekend. We were so surprised to find this little piece of heaven. We hiked up to the fire tower and also did Deep Creek. Relaxing in the Hot Tub and grilling steaks with this magnificent view. Thank you for sharing your home with us. I was emailed and called and felt truly attended to. Thank you for letting us stay in this beautiful cabin. The view was breathtaking. We had all these plans to go and do stuff. We did some of it but just enjoyed relaxing at the cabin. We traveled from North Wales, UK to stay in this beautiful cabin. We saw the solar eclipse right from the driveway. IT was stunning. Our stay was beautiful. We hope to return one day. We highly recommend the Bear Bottom Chalet! We wanted a secluded, high on mountain location, with great views and amenities and this place did not disappoint. The host provided great directions and instructions for entry very quickly and everything went very smoothly. The amenities were superb with the hot tub and outside island with built in grill and burners. There's even an outside refrigerator, patio table and chairs, and deck lounges which we used often to watch the sunset in the evenings which was very relaxing! You won't regret getting this place for a secluded couple's getaway! We enjoyed every day of our stay in this beautiful cabin. The views from the deck were ever changing as the fog came in and lifted off each morning. The sound of the rain each evening and the various birds chirping. It was so relaxing. We can't wait to come back. We had an issue with the the refrigerator. When we called the staff they got someone to come and bring us a big cooler of ice and called to make sure everything was ok. They were very attentive and very efficient. We would definitely stay again. The staff I spoke with to make the reservation were incredibly nice and helpful, and it made me feel welcome! This was our first time in the Smokys here in North Carolina. We came for a weekend getaway and it was just what we needed. We loved the hot tub, made a couple of fires i the fire pit, adn grilled out. Spending time in this beautiful cabin with him reminded me how much I love him. Thank you for the wonderful memories.